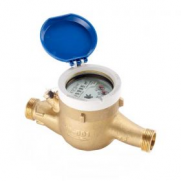 The ZENNER MNK water meter is an MID-compliant residential water meter, proven by the million, for service connection. Continuous further development guarantees the most precise measurement results and the best long-term stability. Its construction, thought out right down to the last detail, guarantees outstanding performance characteristics, minimum bearing loads and a long service life for the MNK water meter. The MNK is available with an uncoated brass body as a standard (optionally with a powder-coated brass body). The Version MNK-N is retrofittable with pulser (reed) for remote readout systems.